Things we did today...: We had our adventure after all! We had breakfast this morning sitting on a bench overlooking the ship channel. Bruce decided we would go out sailing today. The wind was very light out of the west and the sun was bright in a partly cloudy sky. 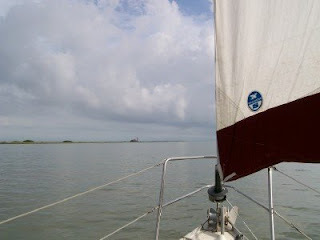 We put on the headsail and motored out after fueling up at the fuel dock now that it was above water again. We tried to make our way down the crab man channel but were doing less than a knot…so we jibed around and tried to go towards Rockport. I got up on deck in the shade of the sail. It was beginning to look like a hot one. Bruce finally gave up on the idea of sailing as we were getting knocked by the wake of the many dolphin swimming around our boat. We parked the boat in the slip and set out in the dinghy. We thought we would try our luck at beach combing. Maybe the storm surge had beached something interesting. We saw some strange fish schooling around so I took the helm and positioned Bruce close to them so that he could throw a lure out into their midsts. He got a hit immediately but it severed his line. He reloaded with a steel leader but the fish had gone. We puttered around looking for them for a while but the wind came up and it looked stormy. We had just a smattering of little raindrops when they were pouring down just a few feet from us. It was very weird. 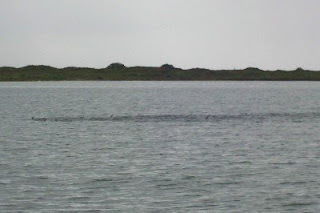 We got back to the boat after testing the limits of our little 5 hp dinghy motor. It was fun! 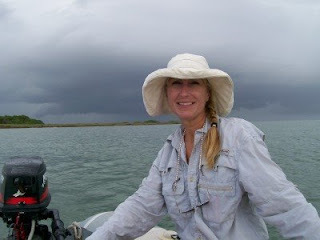 We sat in the cockpit having boat chicken as we watched the first cool front of the season blow in from the North. It soon began to look like the rain would get us and the wind was howling. 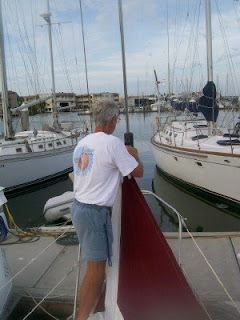 Bruce thought it would be nice to re-tie our neighbor’s boat to ours to keep it from blowing onto the dock and scuffing their sides so he went over to throw me the lines. This is when it chose to begin pounding us with giant raindrops. We finished the job and took refuge inside to wait out the passage of the front. This seemed like a good time for another nap. It had been a strange and wonderful 4 day weekend after all. We had our adventure!